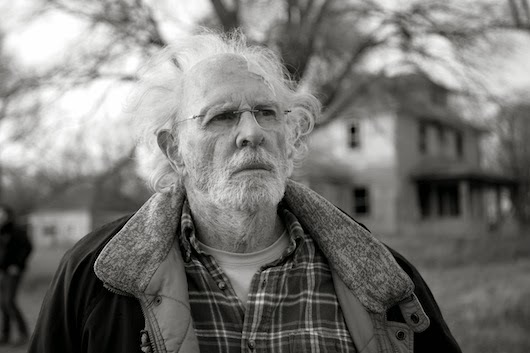 We admire the casting of Bruce Dern, the black and white throwback look and the embodiment of the spirit of 70’s mavericks such as Bob Rafelson and Hal Ashby, but the story of a confused old man bonding with his son over a road trip from Montana to Nebraska has Payne pushing well-honed salt-of-the-earth schmaltz a little too much. If this were Alexander Payne’s first or second or even third film Nebraska might have been seemed like a refreshing throwback picture, but we can’t help but have Sideways and About Schmidt in our minds, similarly-toned road movies of male bonding in middle America. That said, as a memento in Payne’s filmography, after his career is long gone, we will probably view this picture as one of a number of treasures along the same lines as Woody Allen’s consistent career. In the moment, it’s hard not to want more from Nebraska. Bruce Dern is introduced as Woody Grant, an elderly man who has wondered from his home walking alongside the highway, on his way to Lincoln Nebraska. Why? To collect his million dollar prize from his mail-in sweepstakes promotion he’s been fooled by. His son David (Forte) is sick of this behaviour, who seems to continually dote on his father’s consistent senile dalliances. We can’t blame David’s frustration, a single 40-something who works an unfulfilling sales job at a local Best Buy-type store and on the backend of another failed relationship he seems to be held back by his father’s crotchety stubbornness. Eventually David gives in to his father’s inane demands and takes him on a road trip from Billings Montana to Lincoln Nebraska, by way of Woody’s home town along the way. If this sounds vaguely similar to About Schmidt it does, right down to the complimentary casting of Bruce Dern, Jack Nicholson’s co-star in Bob Rafelson’s 1972 classic The King of Marvin Gardens. Comedy is of the deadpan variety, in extremis in the case of Dern’s performance. His frazzled hair, bum-knee gait and sleepy expression will cause as many yawns in the audience as yucks. The melancholy runs its course over the first act and the film only kicks in when the Woody and son visit his brother (Rance Howard) and his two dimwitted sons. While overly simple the sons’ gleeful hangup on David’s two-day drive to Nebraska from Billings provides the most consistent laughs. But Payne’s films don’t strive for laughs, but finding joy and positivity in the unexceptional moments in life. The central framing device of Woody’s sweepstakes win becomes a touching moment of sad reality when we realize what was coming all along – poor Woody has been taken for a ride by the shameless promotions company. Payne and writer Bob Nelson cleverly turn this dejection into a small moment of victory in the film’s tender but profound climax – a triumphant tour through Woody’s hometown which means the world to him. Buyer beware, Bruce Dern’s acclaimed performance and multiple accolades sets up aggrandized expectations. I’m probably in the minority but to these eyes Dern was only adequate as the rumpled old patriarch, a mostly physical performance buoyed by his place in cinema history and his overly sympathetic characterization as a sad old man with terrible hair.